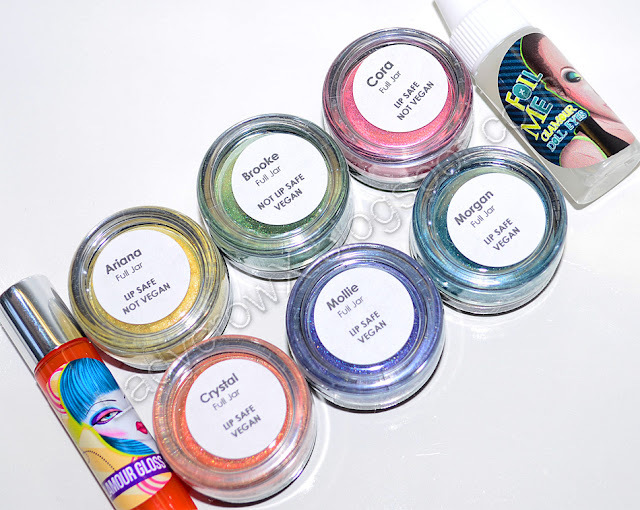 Glamour Doll Eyes recently released a new collection of shadows for summer called "Summer Girls", this collection is limited edition and exclusive to only 100 sets. 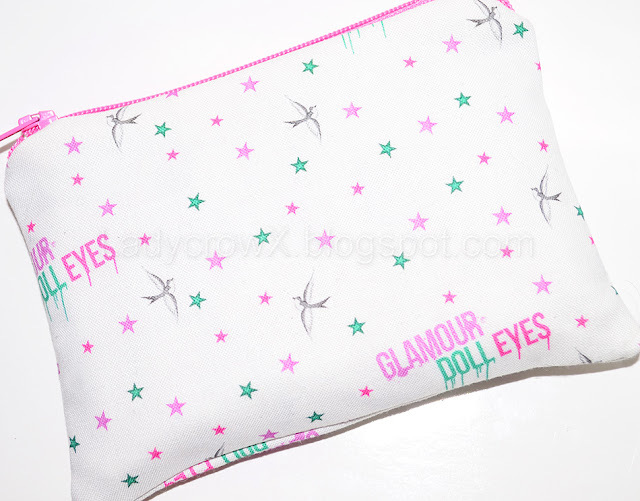 Glamour Doll Eyes wants you to start off your summer looking super cute, bright and funky. Are you hanging out with the beach, spending the summer abroad, traveling with friends? Whatever you're doing, we have the set for you! In this set, you will find everything you need for any day or night look, just throw it in your suitcase or purse and go! 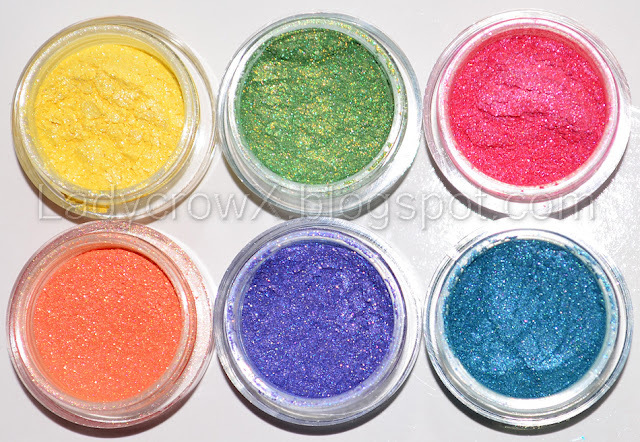 6 Eye Shadows: in a 5 gram jar, without sifters. Cora - a medium to bright pink, slight orange hue and pinkish red sparkles. This color is NOT vegan. Ingredients: Mica, Titanium Dioxide, Carmine, Iron Oxide, Calcium Aluminum Borosilicate, Tin Oxide, Silica. Safe For: Eyes, Lips, Face & Nails. Mollie - a bluish purple (more purple) with golden sparkle. Ingredients: Mica, Titanium Dioxide, Blue #1 Al Lake, Hydrogenated Polyisobutene, Palmitic Acid, Preservatives, Iron Oxide, Calcium Aluminum Borosilicate, Silica, Tin Oxide. Safe For: Eyes, Lips, Face & Nails. Ariana - is a super pale yellow with slight pink shimmers. This color is NOT vegan. Ingredients: Mica, Titanium Dioxide, Yellow 5 Lake, Hydrogenated Polyisobutene, Palmitic Acid, Tin Oxide, Carmine. Safe For: Eyes, Lips, Face & Nails. Crystal - a light orange, almost coral with green sparkle. Ingredients: Mica, Titanium Dioxide, Iron Oxide, Tin Dioxide, Calcium Aluminum Borosilicate, Silica. Safe For: Eyes, Lips, Face & Nails. Morgan - is a blue with purple undertones and a greenish blue sparkle. Ingredients: Mica, Titanium Dioxide, Blue #1 Al Lake, Yellow #5 Al Lake, Hydrogenated Polyisobutene, Palmitic Acid, Iron Oxide, Tin Oxide, Calcium Aluminum Borosilicate, Silica. Safe For: Eyes, Lips, Face & Nails. Brooke - is a medium green with a yellow/gold duochrome. Ingredients: Mica, Titanium Dioxide, Chromium Oxide Green, (glycidoxphenol) propane/bisaminomethylnorbornane copolymer, Ferric Ferrocyanide, Blue #1 Al Lake, Yellow #5 Al Lake, Hydrogenated Polyisobutene, Palmitic Acid, Tin Oxide, Silica. Safe For: Eyes, Face & Nails. What is Foil Me? - Use our "Foil Me" to apply your shadows wet or use as a liner to add a little drama to your look! This is a nice squeeze bottle and will also include a card with instructions. Ingredients: Water, Hydroxyethylcellulose, Polysorbate 20, Propylene Glycol, Diazolidinyl Urea, Methylparaben and Propylparaben. Size: 6 ml, 0.20oz. Zoe - bright orange Ingredients: Versagel, Stevia, Flavor Oil, Silicon Dioxide, Jojoba Oil, Microspheres, Orange #5, Polyester 3 resin and Yellow #6 Safe For: Lips Size: 3.5 ml, 0.12 oz. Each item will come packaged with their own label. 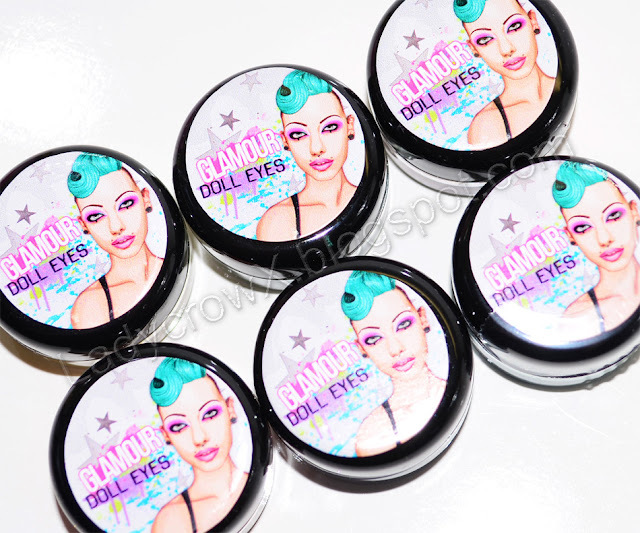 The shadows have a limited edition Glamour Doll label and the names of each color on the bottom. The foil me and glamour gloss comes with a normal label on it, glamour gloss has the name of the color. This collection is extremely limited to only 100 sets (total), so get them fast! I love this set and I am tempted to buy a second one as a backup! The colors are gorgeous, the pigmentation is great, and they blend really easily. The Glamour Gloss in Zoe has almost a summer smell, kind of something like a coconut smell but is very subtle. It's moisturizing and feels very nice on the lips as well, the pigmentation is more on the sheer to medium side but I think that works well for being an orange shade. Oh. my. god. That green screams my name, it looks fantastic. The other colours do, too, but that green is a stunner!! Wow- these colors are amazing!!! love!! The green and the bright blue are just to die for!